The Voltcraft Power Monitor Pro is a digital instrument that measures voltage, current, frequency and phase angle on a single phase mains operated device. 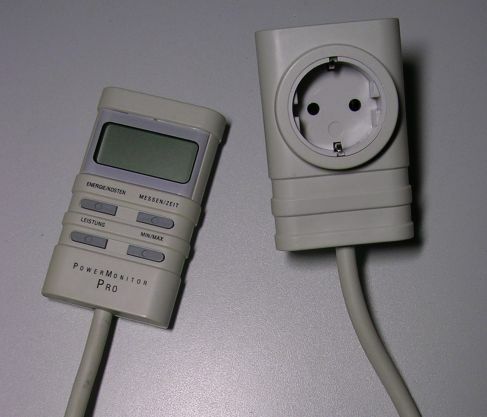 The measurements are supplemented with intelligent features to instantly display power and energy consumption, trace minimum and maximum values or to clock operating times. Again this is a cross marked „out-of-the-plastic-box“ unit and it lied around under my desk for at least a year until I remembered its existence a few days ago after having done my taxes. Tax declarations are anything but a favourite pastime, you know, and faulty measurement devices are a perfect compensation in my opinion. The Power Monitor seemed to work properly as the display showed the default screen on power-up. 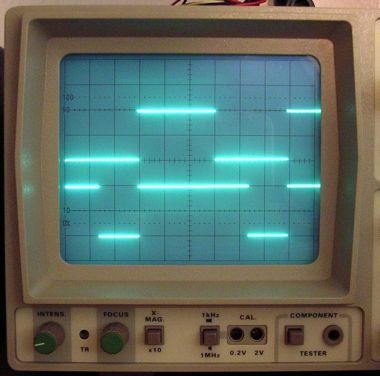 However, it just always displayed 0 volts and 0 amperes and did not measure anything except from the 50Hz mains frequency. So I opened the plug unit first to see what was going on. 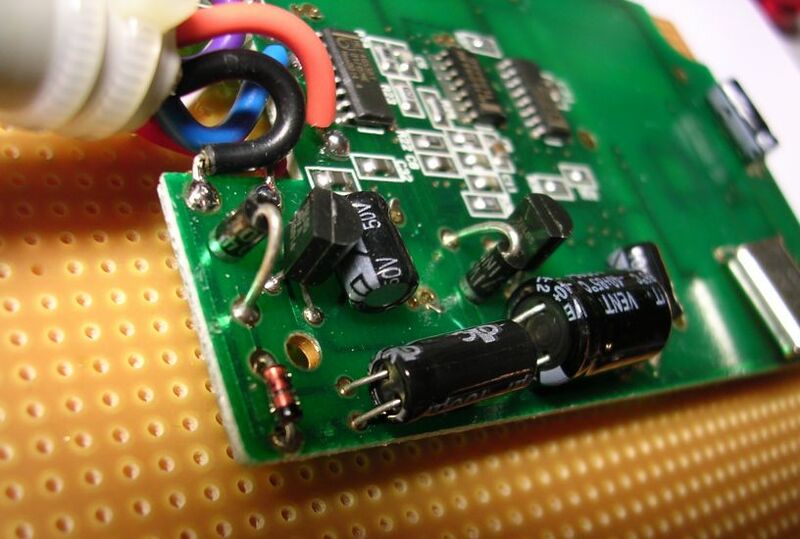 The plug unit contains a small PCB with a shunt wire, a 1µF MKP capacitor and a 100Ω resistor. 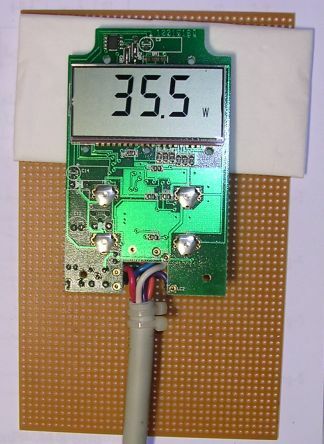 The shunt wire is connected in series to the load under test and allows measuring the current. 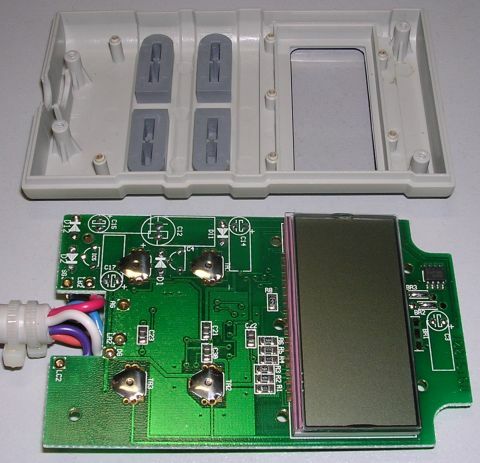 The series connection of capacitor and resistor and panel unit electronics is connected in parallel with the mains supply. 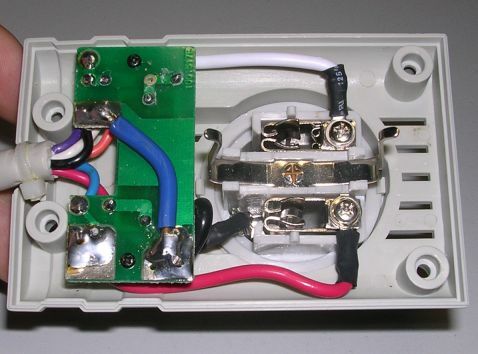 This circuitry is a cheap and resonable alternative to using a mains transformer in case you both have only a small load to supply and do not need galvanic isolation. No defective parts in here. Opened up the panel unit and checked the cable connections from panel to plug. One may think that broken cores should be too easy to be suspected but on the other hand there is nothing more obvious to be checked next. 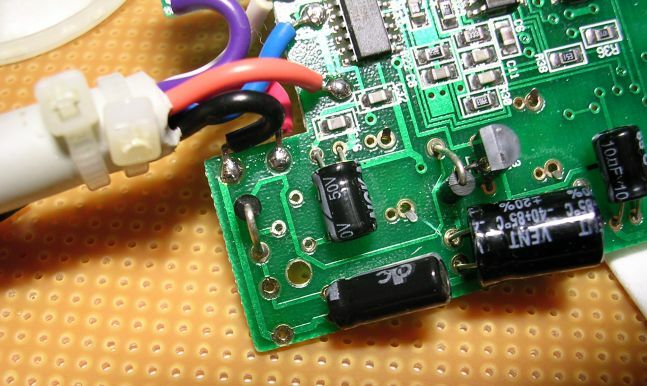 Besides mostly SMD parts on the panel unit there are a few conventional through-hole components that, in combination with the already mentioned capacitor and resistor in the plug unit, form the voltage supply and stabilization circuit. 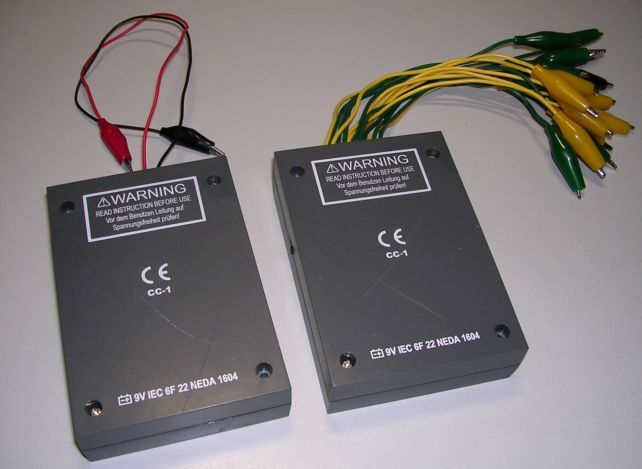 In fact, the Power Monitor requires a symmetric supply voltage of +/-5V. 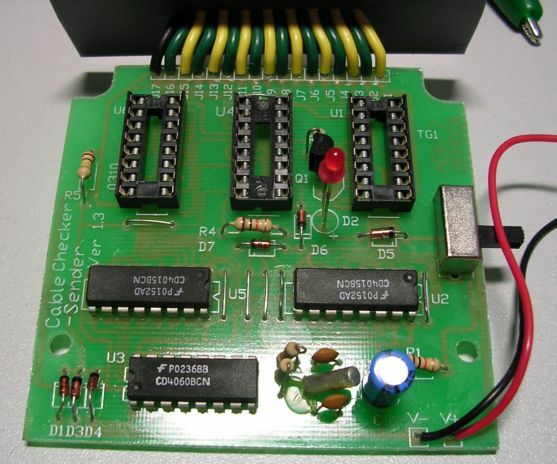 This is achieved with the positive and negative half cycles running each through a 1N4001 rectifier diode in series with a BZX55C15 Z-diode to limit the peak input voltages on the following two 78L05 and 79L05 voltage regulators. 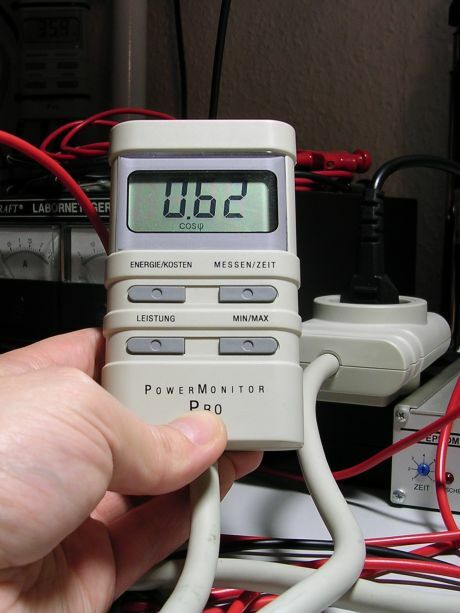 There is a rule of thumb saying that a malfunctioning power supply is the cause of about 90 percent of all failures. This rule prove true again when I found the Z-diode in the negative leg to show a voltage drop of 86mV in both directions. Replaced it with a standard ZPD15 and also replaced the 79L05 voltage regulator although, to be honest, I did not check if this was really necessary. Now the Power Monitor is fully operational again and meanwhile monitoring my fridge. 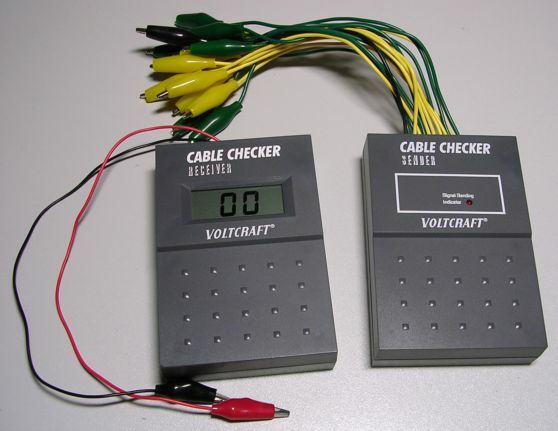 The Voltcraft Cable Checker comes in a set of 9V battery powered transmitter and receiver and allows you to check and identify up to 16 cores in a cable at a maximum resistance of 25kΩ. A possible usage scenario is testing cables with indistinct colour code, preferably on a wide distance across rooms or buildings and with only one person. Just connect the terminals 1~16 and circuit ground of the transmitter on one end and the receiver will indicate the number of each core on the other end. 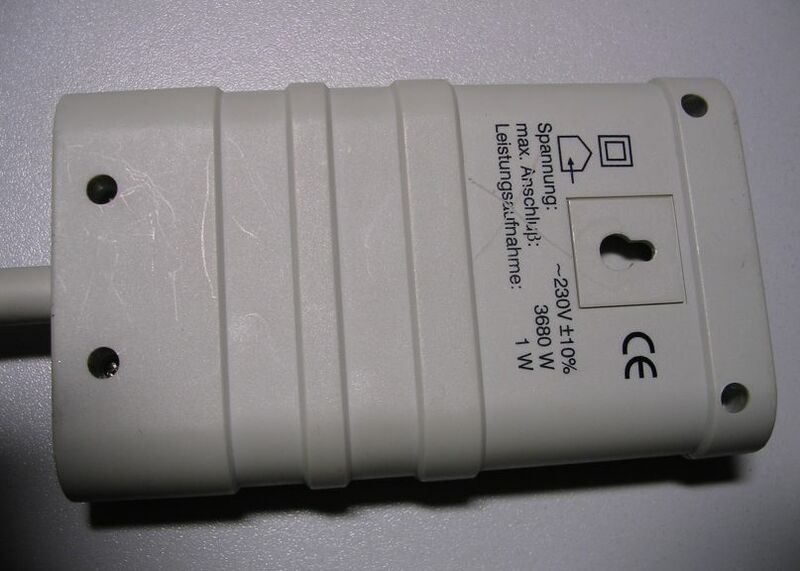 Of course, the Cable Checker is another episode of these cross marked out-of-the-plastic-box units and again it was at least a little bit faulty when I took it home. Hey, don’t you like faulty toys? The receiver worked fine and so did the transmitter, except for channel 6 which was dead. 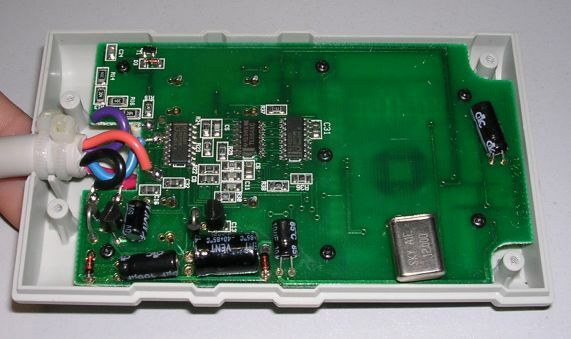 After opening the box I saw three CMOS 4049 UBCN driving the terminals without additional protection. 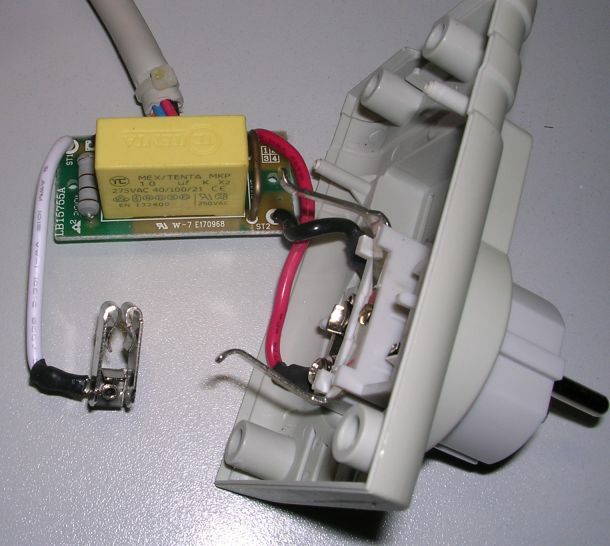 So, this is why the manual says that „applied voltages in excess of 7 V DC or AC will damage the transmitter and it is therefore crucial to make sure that the cable under test is dead“. Even with respect to the price the Cable Checker is a cheapo and it will die instantly if you forget to think before connecting it. As thinking is sometimes a difficult business, I decided to install three IC sockets for the drivers. The PWM signals generated by the transmitter are shown on the scope for channels 1 (top) and 8 (bottom) at 5ms/DIV. 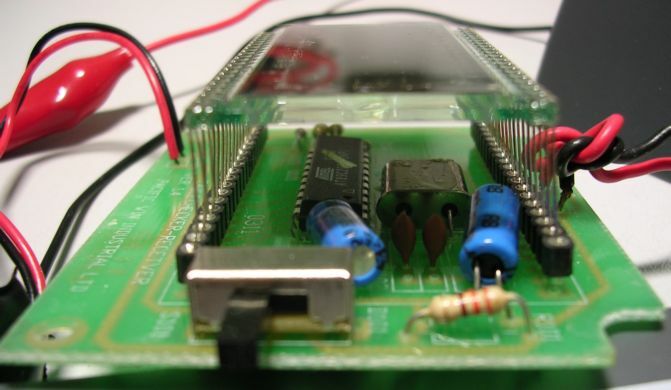 The receiver is based on an 8031 compatible Atmel 89C1051 microcontroller with 1K bytes internal flash memory. 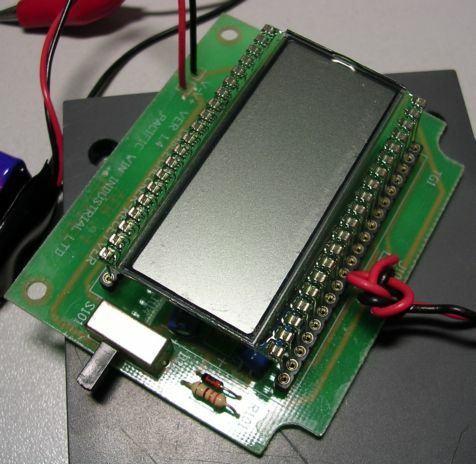 It directly drives a standard 3½ digit LCD. 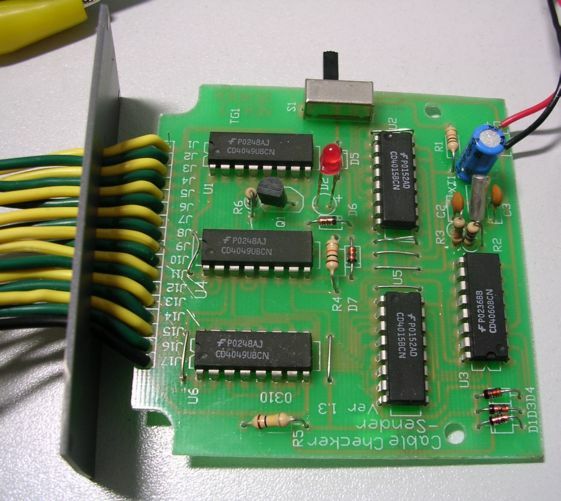 This box is the most expensive part of the Cable Checker and its only input is well protected with a resistor and two diodes. You are currently browsing the Hajo's weblog archives for August, 2005.